When Despicable Me became 2010�s seventh-biggest hit in the US, it inevitably set up a sequel. 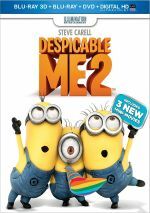 2013 brought Despicable Me 2, an even greater success: the second film made over $100 million more in the US and wound up at number four on the year-end chart. As for me, I thought the first movie offered mild entertainment at best, but the franchise boasted enough promise to send me toward Me 2. 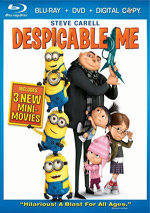 Gru (voiced by Steve Carell) attempts to adjust to life as the adopted dad of young girls Margot (Miranda Cosgrove), Edith (Dana Gaier) and Agnes (Elsie Fisher). Despite his history as a supervillain, Gru tries to �go straight� via a company that makes jams and jellies. Gru�s past comes back when the Anti-Villain League requests his assistance. Someone steals a secret Arctic laboratory, and the AVL believes an �insider� like Gru can best solve the mystery. Gru suspects his supposedly dead rival El Macho (Benjamin Bratt) led this operation. Along with AVL Agent Lucy Wilde (Kristen Wiig), Gru investigates the case while he still attempts to maintain his life as a caring dad. Like I alluded earlier, I can�t claim the first Despicable Me floated my particular boat. Oh, I think it offered decent entertainment but it never quite lived up to its potential. As I also mentioned, I hoped that Me 2 would take advantage of the options better than its predecessor. 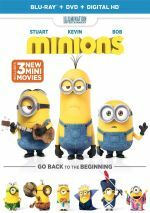 Well, there�s always 2017�s Despicable Me 3, for Me 2 follows the original film�s path and gives us another mildly enjoyable but lackluster comedy. In my view, sequels usually follow one of two possible paths. Option One: emboldened by the success of the first film, the next chapter takes chances and leads the characters and situations in new directions. Option Two: desperate to recreate the success of the first film, the sequel plays it safe and largely attempts to replicate its predecessor. Many of these movies do little more than remake the original with minor twists. To the filmmakers� credit, Me 2 takes the first route � to a degree, at least. This means it manages to open up the World of Gru in new ways, though I can�t claim it goes out on any particular limbs. Still, I feel happy that Me 2 doesn�t just remake the original. It brings us new characters who add to the franchise, and it expands Gru�s personality in fresh ways. Heck, it even allows for romance � however inevitable � to develop between Gru and Lucy. So with the movie�s semi-creative developments, why does Me 2 leave me as mildly cold as its predecessor? Shouldn�t the film take advantage of the comedic potential hinted at in the original? It should � it just doesn�t. No matter how much attempted creativity and fun Me 2 throws at the screen, it never quite sticks. This means that in terms of entertainment value, Me 2 provides a near duplicate of the first film. Like Despicable Me, the sequel boasts a fun premise, a plot with lots of potential, a good cast and a vivid, lively world that should allow the material to shine. But it doesn�t, as the film continues to offer moderate entertainment at best. Actually, Me 2 comes as a minor step down in quality from the its predecessor, as it fails to connect with its material as well. Me 2 feels more like �product� than the first flick did, and that creates a drag at times. None of this makes Me 2 a bad film, and it does come with some moments of mirth. In particular, a feisty �guard chicken� named Pollito adds fun to the proceedings and acts as a standout character. Otherwise? Meh. Despicable Me 2 manages to do just enough to muster minor entertainment across its 98 minutes, but it never turns into anything special. Footnote: stick around through the end credits for more goofy antics from the Minions � these bits finish at the 1:33:55 mark and nothing else follows. As was the case with the first film, the Minion silliness works best in the movie�s 3D version. Despicable Me 2 appears in an aspect ratio of approximately 1.85:1 on this Blu-ray Disc. As expected, this became a terrific visual presentation. Sharpness worked well, as virtually no softness materialized. Instead, the image remained tight and concise at all times. Both shimmering and jaggies were absent, and I saw no edge haloes or source flaws. Like the first film, Me 2 opted for a bright, varied palette. It leaned teal at times but went for a lot of purples and pinks as well, all of which popped off the screen. Blacks appeared deep and dense, while low-light shots boasted fine clarity. I felt pleased with this very appealing image. I also liked the fairly ambitious DTS-HD MA 5.1 soundtrack of Me 2, as it used the soundscape well. With plenty of action scenes, the mix opened up to create a vivid sense for various elements, and these meshed together in a satisfying manner. Music presented fine stereo presence, and quieter scenes worked fine. Given the number of fights and chases and all the craziness, much of the movie aimed for sonic pizzazz, and the mix delivered those moments well. Audio quality followed suit and seemed strong. Music appeared vivid and full, while speech came across as concise and distinctive. Effects provided accurate, tight tones with excellent low-end response. This wound up as a terrific track. As we move to extras, we begin with an audio commentary from directors Chris Renauld and Pierre Coffin. Both sit together for this running, screen-specific look at story/character areas, design choices, influences and allusions, cast and performances, music and related topics. I really liked the Coffin/Renaud track for the first film, and this one follows suit � minus the participation of the Minions, who offered occasional silliness during the prior movie. Even without the goofy characters� involvement, the directors� chat becomes a lively, involving piece. They tell us a lot about the movie�s creation and make this a useful look at the flick. Three Mini-Movies appear. We get �Puppy� (5:07), �Panic in the Mailroom� (4:46) and �Training Wheels� (4:48). All come with introductions from Steve Carell in character as Gru. �Puppy� shows the Minions� unusual attempts to bring a new pet into Gru�s household, and �Panic� lets us view goofy antics related to Minions stuck in menial work. Finally, �Wheels� views Agnes�s Minion-aided attempts to ride a bike. Though a pretty blatant take on ET, �Puppy� offers real charm and heart. �Panic� goes for more blatant comedy and has some laughs, though it�s not as good as �Puppy�. �Wheels� fares worst, mainly because it turns dopey with a silly action orientation. We also find a featurette that relates the Making of the Mini-Movies. It runs five minutes, 45 seconds and offers info from Renaud, Coffin, producers Chris Meledandri and Janet Healy, and directors Mark O�Hare, Fabrice Joubert, Eric Favela, Regis Schuller, Yarrow Cheney and Bruno Dequier. In this short piece, we get quick notes on story/characters as well as inter-continental collaboration. Though awfully brief, �Making� offers a smattering of decent notes. A Deleted Scene lasts 46 seconds. Called �Gruties�, it adds a minor extension to a sequence in the final flick. I suspect it got cut because it took away from the sadness/isolation of young Gru, as �Gruties� opts for broad comedy instead. It�s funny but I understand why the filmmakers preferred pathos. The set includes six more featurettes: �The Minions� (3:08), �Evil Minions� (4:20), �A Gru-some Transformation� (5:28), �El Hombre Malo: The Villainy of El Macho� (4:18), �Gru�s Girls� (5:36) and �Gadgets Galore� (4:13). Across these, we hear from Carell, Meledandri, Renaud, Coffin, Healy, co-writers Cinco Paul and Ken Daurio, production designer Yarrow Cheney, production/character designer Eric Guillon, editor Gregory Perler, and actors Miranda Cosgrove, Kristen Wiig, Benjamin Bratt, Moises Arias, Elsie Fisher and Dana Gaier. The clips discuss the Minions, character design, cast and performances, and the movie�s gadgets. Occasional bouts of information arise, and we get decent notes about design topics. Nonetheless, a lot of fluff appears, so don�t expect greatness. The disc opens with ads for the �Minion Mayhem� attraction at Universal Studios, the �Minion Rush� app, Barbie and Her Sisters in A Pony Tale and Monster High: 13 Wishes. Previews adds promos for Paranorman, Despicable Me, Hop, Barbie Mariposa & The Fairy Princess, Monster High: Ghouls Rule, An American Girl: Saige Paints the Sky and Dr. Seuss� The Lorax. No trailer for Me 2 shows up here. A second disc offers a DVD Copy of Me 2. 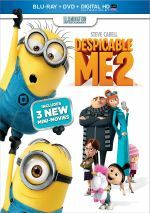 While I hoped Despicable Me 2 would springboard off the first flick�s positives, instead it seems like a fairly flat sequel. It comes with minor mirth but fails to turn into anything memorable or especially entertaining. The Blu-ray boasts excellent picture and audio as well as a collection of supplements headlined by an informative commentary. Maybe Despicable Me 3 will hit the spot, but Me 2 fails to engage.